Badminton is a sport which enthralls all and played by masses with only few who reach the desired level. Manav Rachna Sports Academy finds hidden and raw talent and grooms them to be the shining stars of Badminton by providing every possible measure and exposure to bring out the best in them. We are running three kinds of programs catering the need and level of players in which we follow specific game plans so as to stretch their comfort zones every now and then and to make each session harder than the previous one so as to make the body realize enough is not enough in our training modules. Manav Rachna Sports Academy is the first of its kind who possess fully air-conditioned six synthetic indoor Badminton courts facility in Haryana, equipped with the latest amenities matching international standards. A tie-up with YONEX ensures that apparels, accessories and entire kits for the sponsored students and coaches are never in short supply. Separate Boys and Girls Locker rooms to take rest during the long hours of grueling sessions. The programs are designed keeping the 360 degree view of the players ranging from performance to endurance. We have set divided batches so as to provide fair play chance to all players to enhance their performance. A One day free trial classes are offered which give an overview to the coach about the child and its quite crucial for us to make the child feel welcome to the environment and from there the game starts after achieving a bond of trust. All the eligible certificates to be duly submitted at the time of admission to avail the Scholarship. All the Scholarships are applicable for a year. Performance will be monitored on every Six Months basis. Fees can be deposited monthly & 10% Scholarship shall be applicable for those who submit quarterly fees every time. AC Rooms are available on request and availability. INR 2000 (Per Month) will be charged extra for AC Rooms. The Scholarship is only applicable on training fees not on Boarding & Lodging. Known as Marathon man of Badminton, Former Chief Coach of Junior National team of India for 11 years. 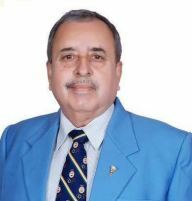 Mr. Sachdeva has been the guiding light of the Badminton program at MRSA, his constant support to the coaches and athletes has helped the academy in its success.